He used to come here regularly and take darsana… He was standing before the deities and my father (Sri Gaura Candra Gosvami) gave him a garland and some maha-prasadam. Actually at that time my father’s eyesight was very poor but somehow he understood that this person was not an ordinary sadhu. He approached him and requested him to stay here at Radha-Damodara Temple and perform his bhajana. I do not wish to disturb the position of the sevaites at Radha-Damodara temple, but simply if I am given facility to live there with my disciples, it will be my pleasure to serve Their Lordships Sri Sri Radha-Damodara to my best capacity. For six years, from 1959 to 1965, Srila Prabhupada lived in two rooms that adjoin the center courtyard of the temple. It was in these two rooms that Srila Prabhupada began to formulate his plan to spread Krsna Consciousness around the world, and it was at the Radha-Damodara Mandira that Srila Prabhupada became fully empowered by Sri Sri Radha-Damodara and all of our acaryas, headed by Srila Rupa Gosvami, to fulfill the desire of the Golden Volcano of Pure Love, Sri Sri Gaurasundara, by taking the names of Krsna to every corner of the world. In his rooms at Radha-Damodara, Srila Prabhupada would fervently pray to Sri Sri Radha-Damodara Thakuraji, his guru Senapati-visvacarya Sri Srimad Bhaktisiddhanta Sarasvati Thakura Prabhupada, Srila Rupa Gosvami Prabhupada, the Sampradaya-acarya, and all the saints in our illustrious Brahma Madhva Gaudiya Vaisnava sampradaya for empowerment to fulfill the desire of Sri Caitanya Mahaprabhu, which was manifest in his own guru and became his order. It was there he began his translations of Srimad Bhagavatam, that would later become the most recognized edition by scholars and the educated echelons of every country in the world, finding its way to all the elite libraries on the planet. 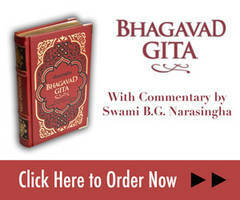 It would also become the standard edition for all Vaisnavas around the world. In his small rooms at Radha-Damodara Mandira, Srila Prabhupada would begin his campaign to spread the creed of Sri Caitanya Mahaprabhu, which is the pinnacle, the very zenith of all religious thought, to every city, town, and village. Srila Prabhupada once told my father (Sri Gaura Candra Gosvami) that it was at Radha-Damodara he received direct permission from his Gurudeva to go to the west and preach. Actually he said it was an order, not permission…Srila Prabhupada told my father about his sphurti-darsana (revelation) at the puspa-samadhi of Bhaktisiddhanta Sarasvati Thakura and he said he understood this order was absolute because this happened at his Gurudeva’s samadhi. Taking the order of his guru on his head, in old age, and with practically no money, he executed his campaign with full faith in the protection and guardianship of Sri Sri Radha-Damodara. It can be said with sraddha (faith) alone, Srila Prabhupada set out to do the impossible. Because he had full faith in his guru and the blessings of Sri Sri Radha-Damodara Thakuraji, he was able to accomplish the task. On the order of his guru, Srila Prabhupada set out to help the conditioned souls all over the world find their way back to Vrndavana and attain the ultimate goal of life, love for Krsna. In order to do that he gladly left his comfortable position in Vrndavana and took on almost impossible hardships for one of his age. Srila Prabhupada did not travel for his personal sense gratification; to increase his credentials as a ‘man of the world’, or to see the sights, as is common with the ordinary conditioned soul on his sojourn in this material world. He had but one determination, to spread the Holy Name to every town and village as desired by his guru. For that purpose, he gave up an easy life of bhajana at Sri Sri Sri Radha-Damodara Mandira. With unwavering strength of mind, steadfast resolve and fortitude, he fearlessly pierced the heart of Kali-yuga and began his preaching campaign in New York City. He epitomized the type of sadhu that Visvacarya-senapati Sarasvati Thakura had hoped for and desired to produce. The rest is history. The impossible became possible by the mercy of Sri Sri Radha-Damodara and His servants. Srila Prabhupada fulfilled the prophecy of Srila Bhaktivinoda Thakura, who predicted an extraordinary soul would appear and spread the Holy Name around the world. That extraordinary soul was none other than His Divine Grace Srila A.C. Bhaktivedanta Svami Prabhupada. Today thousands from around the world are finding their way to Vrndavana, all by the mercy of Srila Prabhupada, and when they come, they all visit the rooms of Srila Prabhupada, his bhajana-kutira which he called, ‘The Center of The Spiritual World’, to get the darsana of Srila Prabhupada who is eternally present there. Countless devotees of Krsna sit in awe and reverence in the place Srila Prabhupada began his life’s calling. For first time visitors it is a very emotional experience to be present in the place Srila Prabhupada planned his campaign to save them from the clutches of Maya. Some sit for hours on end chanting the Holy Name with tears of love for Srila Prabhupada, realizing the impossibility of ever repaying him for his causeless mercy upon them. Every year the numbers grow as more and more people take to the creed of Sri Caitanya Mahaprabhu, the Golden Avatara. Srila Prabhupada considered his rooms so important that he told his disciples, even before he entered the eternal pastimes of Sri Radha-Damodara; they should begin the seva there. Srila Prabhupada instructed his disciples that they should keep a photograph of him in his room and offer him the maha-prasadam of Sri Sri Radha-Damodara. Srila Prabhupada requested that a written inventory of all the paraphernalia in his rooms including books, manuscripts, pots, plates, spoons, cups, etc. be meticulously kept. Srila Prabhupada further requested that his sannyasi disciples should be the ones to maintain the rooms and do service there. Even after building his temple in Ramana-reti, the glorious Krsna-Balarama Mandira, Srila Prabhupada would regularly visit the Radha-Damodara Mandira and take prasadam in his rooms. In 1972, he delivered a lecture series on the Bhakti-rasamrta-sindhu in the courtyard of Srila Rupa Gosvami’s samadhi and bhajana-kutira adjacent his kitchen. Srila Prabhupada always stressed the importance of his rooms at Radha-Damodara temple and the overall importance of the mandira as a whole. To properly understand Vrndavana and the importance of the Radha-Damodara Mandira, one should clearly understand the ontological position of Sri Rupa, Sri Sanatana, and Sri Jiva. In the nitya-lila of Sri Sri Radha and Krsna, the madhurya-rasa is considered the topmost. In the madhurya-rasa, Sri Radha is the supreme reservoir of prema for Sri Krsna. The whole plane of the madhurya-rasa is the majesty of Her sentiments of devotion and love for Sri Krsna. This highest expression of prema for Sri Krsna is called maha-bhava and it is exclusively the domain of Sri Radha. Sri Radha has a multitude of confidential associate servitors imbued with aspects of Her loving sentiments for Sri Krsna, chief of which are the asta-sakhis – Lalita-devi, Visakha-devi, Citra-devi, Indulekha-devi, Ranga-devi, Tungavidya-devi, Campakalata-devi and Sudevi. Of these eight gopis, Lalita-devi and Visakha-devi are the principle two and of these Lalita-devi is the constant advisor to Sri-Radha. Under the shelter and care of Lalita-devi are the younger gopis known as manjaris. These manjaris are of very tender age and are the choicest servants of Sri Sri Radha and Krsna during Their various intimate loving pastimes in the forest of Vrndavana. Like Sri Sri Radha and Krsna the gopis and the manjaris all have especially pleasing spiritual bodies made of the supremely transcendental substance known as cinmaya-rasa. As such there is no material desire that can contaminate the prema-lila of Sri Sri Radha-Krsna and Their intimate associates. One should never think that the love of Sri Sri Radha and Krsna is on the same platform as the so-called love that exists in the material world. Sri Radha-Krsna prema is transcendental and above the contamination of the modes of material nature characterized by lust, anger, and greed. Chief among the manjaris who perform the most intimate service to Sri Sri Radha-Krsna are Rupa-manjari, Lavanga-manjari and Vilasa manjari. These three manjaris have incarnated on earth as Rupa Gosvami, Sanatana Gosvami, and Jiva Gosvami respectively to reveal the lila-sthanas of Radha Krsna, and to establish the truth of Sri Sri Radha and Krsna for the benefit of all human beings. Rupa Gosvami is known as the abhidheya-acarya (reveals the practice), Sanatana Gosvami is the sambandha-acarya (reveals relationships) and Jiva Gosvami is the tattva-acarya (reveals how all the truths fit together). Abhidheya is the principle status in which one is able to serve Radha-Krsna. Sambandha is the knowledge of Radha-Krsna, the living entities and their intrinsic relationship of service. Tattva means the ultimate truth about Radha-Krsna, Their energies, associated, supreme abode, and pastimes. Of all the places of lila in Vrndavana, the area where the rasa-lila of Radha and Krsna was performed is most glorious. During those divine pastimes of rasa-lila, Sri Krsna suddenly took Sri Radha to a secret place in Vrndavana and there in that magnificent grove Sri Krsna became bound by the ropes of Sri Radha’s affection. Thus Krsna became known as Damodara, bound by the love of Sri Radha. This place of magnificent beauty and charm in the rasa-lila of Sri Sri Radha and Krsna is none other than the site where the mandira of Sri Sri Radha-Damodara is located. In a nutshell, Srila Narasingha Maharaja has given a synopsis of the ontological position of the Radha-Damodara Mandira and the Thakuraji’s most intimate servants. Some say that the very spot the Radha-Damodara Deity stands is the place Krsna became bound by the affection and love of Srimati Radharani. The Deity was manifest from the hands of Srila Rupa Gosvami, the Sampradaya-acarya, and presented to Jiva Gosvami in 1542. Although displaying pastimes of leaving Vrndavana in the year 1670, the Thakuraji again returned to Vrndavana in the year 1739 and has resided in Vrndavana since that time. Vrndavana is a charmingly beautiful place, and situated there in the grove known as Seva-kunja is the sacred temple of Sri Sri Radha-Damodara. I take the lotus feet of these Deities as my only shelter, and I petition them to be kind upon me and guide me to life’s ultimate goal. Since the time that the closest associates of Sri Krsna Caitanya Mahaprabhu established The Radha-Damodara Mandira, many saintly persons have come to visit and live there. It was no coincidence that Srila Prabhupada was invited to do his bhajana at the mandira of Sri Sri Radha-Damodara. Sri Sri Radha-Damodara Thakuraji wanted Srila Prabhupada in His own house. In very recent times those with good intent have tried to revive the Visva Vaisnava Raja Sabha. In the future, such an association will fully bloom after again taking up residence at the Sri Sri Radha-Damodara Mandira. Once again, the rajas (kings) of our sampradaya will again convene at their home in Seva-kunja at the Sri Sri Radha-Damodara Mandira. That is the heartfelt hope of this author. My mission is to develop the glories of Srila Jiva Gosvami all over the world. It was the desire of Srila Prabhupada to establish a learning center which he coined as the Rupanuga Para Vidya Pitha, at the Radha-Damodara Mandira. But this learning center was nothing new, Srila Prabhupada simply wanted to revive what had already manifested by the mercy of Srila Jiva Gosvami Prabhupada. For reasons known fully only to Sri Sri Radha-Damodara Himself, the desire of Srila Prabhupada went unfulfilled in his lifetime. If we examine history, we find that Jiva Gosvami became the first professor of the Rupanuga Para Vidya Pitha, shortly after the departure of Sri Krsna Caitanya and Rupa-Sanatana. With the library containing the written manuscripts of the Six Gosvamis and the other luminaries of the sampradaya, Srila Jiva Gosvami created the first Krsna Conscious University. His star students became Narottama Dasa, Dukhi Krsna Dasa, and Srinivasa Prabhu. These three, upon receiving their credentials from Professor Jiva Gosvami Prabhupada, were given the titles Thakura, Syamananda, and Acarya respectively. From that point, they became rajas of the sampradaya, leaders of the Visva Vaisnava Raja Sabha. These three kings of the sampradaya can also be called the first book distributors for Caitanya Mahaprabhu’s mission. With the written manuscripts of the Six Gosvamis, these three jagad-guru paramahamsa Maharajas were sent off by Srila Jiva Prabhupada to Bengal and Orissa to convert the masses to the Krsna Consciousness movement. Srila Jiva Gosvami also used the University as a place to convert others to the creed of Caitanya Mahaprabhu. He would cordially invite scholars and pundits from all over India to the Radha-Damodara Mandira for discussions on spirituality. By this method he converted many to the fold of Mahaprabhu. Srila Prabhupada once told my father that at Radha-Damodara he received direct permission from his Gurudeva to go to the west and preach. Actually he said it was an order, not permission. Already he had the direction, but now it was an instruction. It can be said that Srinivasa Acarya, Syamananda Prabhu and Narottama Dasa Thakura were the first real book distributors. With the written manuscripts of the Six Gosvamis and other luminaries like Krsna Dasa Kaviraja Gosvami, at the bequest of Srila Jiva Gosvami, they set out from the Radha-Damodara Mandira to spread the creed of Caitanya Mahaprabhu. The second giant wave was Srila Prabhupada who took the bhakti-sastras outside of Bharata-varsa. As mentioned earlier in this essay now thousands of devotees from around the world come to Srila Prabhupada’s bhajana-kutira, they want to see the rooms where it all started. But among those coming many do not understand one important point. The Radha-Damodara Mandira is not most important because Srila Prabhupada lived there, but rather Srila Prabhupada lived at The Radha-Damodara Mandira because of the importance of the temple. The Radha-Damodara Mandira is the most important temple in all the Vraja, nay all the world. It is the very center, the heart of the Gaudiya Vaisnava sampradaya and the root of Vrndavana. Srila Prabhupada wanted to be at the center of the Spiritual World. It is also a sad fact that many come to Prabhupada’s study where he began his writings but completely neglect Srila Prabhupada’s kitchen, which ontologically is also his place of bhajana. It may be argued whether or not the kitchen is more important than Srila Prabhupada’s study. The general consensus is that Srila Prabhupada’s study is the most important, to the neglect of his kitchen. But it was the kitchen where Srila Prabhupada daily took the prasadam of Sri Sri Radha-Damodara, the place he received the remnants, the very mercy of Sri Sri Radha-Damodara. It was from the kitchen that he peered out his window at the bhajana-kutira and samadhi of Srila Rupa Gosvami and prayed ardently for Srila Rupa Gosvami Prabhupada’s mercy upon him to fulfill the desire of his guru. So which room is more important? The place he received the prasadam or the place he began to distribute the prasadam? The study is where he began his distribution campaign. In my opinion it cannot be conclusively proven either one is more important. To some the study may be seen as more important, to others like me who is in need of the prasadam and mercy of Sri Sri Radha-Damodara and all his servants it may be the kitchen. If one considers the kitchen more important, and another the study, in my opinion, both are correct. The position of Srila Prabhupada’s rooms and their significance cannot be measured or delineated in one small essay as the glories of Sri Sri Radha-Damodara and His House, the Radha-Damodara Mandira are expanding at every moment. Srila Prabhupada considered his rooms to be the very epicenter of the Spiritual World. Therefore their ontological position cannot be fully described. The Sri Sri Radha-Damodara Mandira truly is the center of the Spiritual World, the most mystical magical place on this planet. If I have any good instruction to give, it is this: Come to Sri Sri Radha-Damodara Mandira! First offer obeisances to the presiding Deity, Sri Sri Radha-Damodara Thakuraji, then to the other Deities. Then circumambulate the temple, which contains the govardhana-sila of Srila Sanatana Gosvami (the circumambulation of this govardhana-sila is equal to a full parikrama of Govardhana Hill), then go to Srila Prabhupada’s study and take his darsana, then go to his kitchen and beg for the prasadam that is distributed there. If the pujari does not freely offer you prasadam, then beg for it until he gives you some. But when you come to the Radha-Damodara Mandira, don’t come just to take darsana and do parikrama – there are enough pure devotees who polish that sacred ground daily with their holy feet. Come to Sri Sri Radha-Damodara and offer yourself to Him. Ask for His seva at His home in the mandira. There can be no better place on earth to render service than at the Radha-Damodara Mandira. There can be no better place to visit or to live than the Radha-Damodara Mandira, and there can be no better place to give of oneself than at the Radha-Damodara Mandira. Sri Sri Radha-Damodara is ready for His servants to come to His Holy Abode and render service to Him. Life in the material body is short, the opportunity may not come again for a very, very long time. Praying at the lotus feet of Sri Sri Radha-Damodara Thakuraji and all His servants this lowly soul begs for their prasadam and mercy on his head. He also humbly requests the Vaisnavas to overlook any imperfections or faults in this composition.